Danny Peterson | 1/22/2019, 3 p.m.
Members of Oregon’s Congressional delegation, including Democrats Sen. Ron Wyden, Rep. Earl Blumenauer, and Rep. Suzanne Bonamici, called on the president to end the shutdown during an appearance Friday at the Oregon Food Bank in northeast Portland. Bonamici said she has voted with the House on numerous bills with bi-partisan support to re-open the government, but they’ve been continually blocked by Senate Majority Leader Mitch McConnell, R-Kentucky, who refused to put them up for a vote because they didn’t include Trump’s wall funding in full. “Stop holding federal workers hostage because Congress won’t get him funding for an ineffective and expensive border wall that he promised that Mexico was supposed to pay for,” Bomanici said. Bonamici said she’s heard stories from a Transportation Security Administration worker who had to sell his plasma just to pay his bills and a law enforcement officer who narrowly evaded eviction for lack of rent money. More than 500 U.S. Coast Guard members in Oregon are continuing their duties, even without receiving pay, Bomanici said, which has been the case nationally, the first time members of the Armed Forces weren’t paid during a shutdown. These stories are examples of why the shutdown is “infuriating” and “must end,” she said. About 800,000 of the 2.1 million federal employees who have been impacted by the shutdown nationally, including 380,000 who were furloughed and are not working and the remainder of which who are considered essential employees and must work without pay. In Oregon, that’s nearly 10,000 federal employees who are either furloughed or working without pay, according to the Oregon Employment Department. 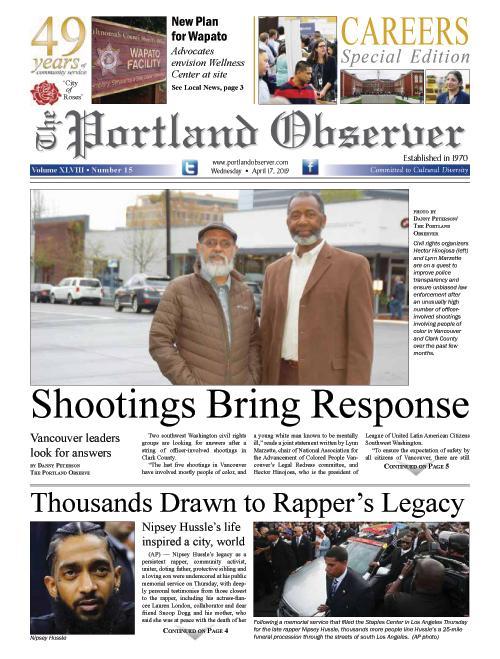 Brian Florence, who works at the federal prison in Sheridan, told the Portland Observer it’s been a struggle for him and other employees at the prison to pay rent, provide food for their families and cover medical costs. Florence, 49, said that although his family has managed to stay afloat so far through limited secondary income from his wife and receiving help from food pantries at Oregon Food Bank and Salvation Army, it’s been daunting not going without a paycheck. “I have two beautiful kids and they need special attention medically. So we have additional costs that are coming in right now and we’re having trouble to figure it out. Like, do we pay our medical bills or do we hold back for gas? Or do we pay our rent? What are we going to do? We have to figure it out,” he said. If the shutdown continues, Florence, who lives in Salem, will again not see a check for the second payday in a row this week. He’s trying to organize for food pantries to come to the prison to drop off food for him and his co-workers. Sen. Wyden personally thanked Florence for his service.